The United Nations Human Rights Council adopted a resolution on Sri Lanka for the fifth time yesterday, but the Government will claim a diplomatic victory after it won a two-year extended timeline to establish mechanisms that will deliver justice to thousands of victims and reconcile a country torn apart by a civil war that spanned three decades. 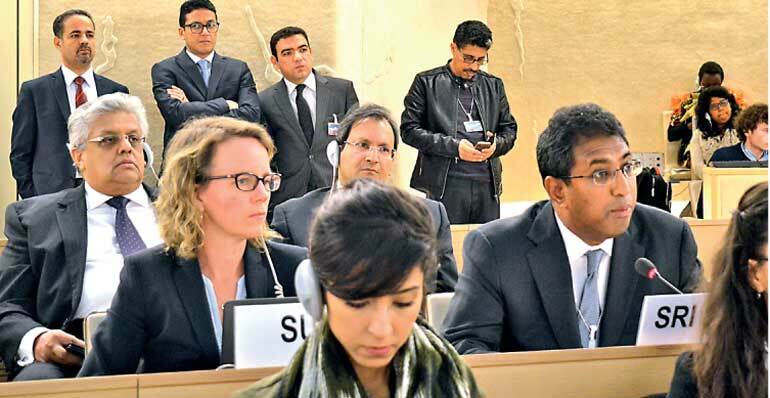 UNHRC Resolution 34/1 titled Promoting Reconciliation, Accountability and Human Rights in Sri Lanka was cosponsored by the Government and adopted by the 47-member Human Rights Council currently in session in the Swiss city of Geneva. For only the second time in five years, the resolution on Sri Lanka was adopted without a vote at the council. Deputy Minister of Foreign Affairs Dr. Harsha De Silva, who is leading the Government delegation in Geneva, expressed Sri Lanka’s appreciation to the council and its member states for the understanding and support for Sri Lanka’s processes for promoting reconciliation, justice and human rights. “We thank them for placing their faith in our Government, and our people, and for walking with us at our side, as we strive to establish Sri Lankan Government-led processes with international assistance, engagement and support for the benefit of all our citizens,” the Deputy Minister said, delivering the statement of the country concerned shortly before the resolution was adopted last afternoon. The United States, the main protagonist of Sri Lanka resolutions at the Human Rights Council, presented the draft resolution before the UNHRC yesterday. Sri Lanka’s decision to cosponsor the resolution at the UNHRC 34th Session was testament to the Sirisena administration’s positive engagement with the international community and its commitment to reconciliation and human rights, said US Head of Delegation, William J. Mozdzierz. The US said it hoped the resolution adopted at the session yesterday would ensure the non-recurrence of conflict and strengthen democracy in the island. The US was joined by the core group of sponsors – UK, Macedonia and Montenegro – and 36 core sponsors, including Sri Lanka. Addressing the council, the UK’s Permanent Representative to the United Nations, Julian Braithwaite recalled the historic moment in 2015 when the UNHRC adopted the first Sri Lanka resolution by consensus, after years of divisions. Sri Lanka had taken national ownership by cosponsoring the 2015 resolution, Braithwaite noted. The UK urged the Sri Lankan Government to come up with a “time bound implementation strategy” to fulfill its outstanding commitments as laid out in the 2015 resolution. The Office of the High Commissioner for Human Rights also informed the Human Rights Council yesterday that the office would require funds of up to $ 362,000 to implement the Sri Lanka resolution. According to the Programme Budgetary Implications attached to the Sri Lanka resolution as submitted by the OHCHR, the budget would go towards six missions to Sri Lanka by OHCHR Geneva-based staff, local transportation, security and communications during field missions, the recruitment of temporary staff and conference and translation facilities for the two reports due before the Human Rights Council. The new resolution calls on Sri Lanka to “fully implement” measures that are outstanding from the 2015 resolution. UNHRC Resolution 30/1 of October 2015 recommended the establishment of truth-seeking and reparations mechanisms and a special court to prosecute grave crimes committed during the final years of the conflict. It also called for broad legal and security sector reform to improve the country’s human rights situation. Sri Lanka’s next major report on the progress made on implementing the 2015 resolution by the High Commissioner for Human Rights will be at the council’s 40th Session in March 2019. The draft resolution also calls for a written report from the High Commissioner at the 37th Session of the council in March 2018. The final draft of the resolution adopted yesterday contains no significant changes from the zero draft that was circulated among member states of the council earlier this month.